Usher in the year of the Rabbit with joyous feasting at One World Hotel's Zuan Yuan Chinese Restaurant, serving a wide plethora of CNY dishes and traditional Yee Sang daily during CNY and even before. One World Hotel's signature restaurant - Zuan Yuan Chinese Restaurant, bids you welcome with an aura of Oriental exuberance. As its name suggest in chinese Zuan Yuan Restaurant means a treasure trove of gems. Silver leaf ceilings, eborny doors and artefacts of wine jars complement the decor and cuisine of the restaurant. Savour Cantonese specialties cooked in various styles that reflect time-honoured traditions within a classical inspired interior decor of sophisticated splendour. Truly a king's feast, indulge in Zuan Yuan's 8-course set menus for the perfect family and friends gathering. Also take your pick and indulge in the enormous repertoire of dim sum gems available for lunch daily. To add to the truly authentic experience is an extensive list of Chinese teas and other beverage to complement your dining experience in Zuan Yuan. Sink into the whole oriental mood and tour china through Zuan Yuan Chinese Restaurant located on Ground level. There are 6 private rooms for discreet dining and private functions. Chinese, especially businessman, believe that partaking of Yee Sang will bring them an abundance of good luck and prosperity. This year chinese chief Michael Chew has specially prepared 4 variety of Yee Sang with different accompaniments to choose from. 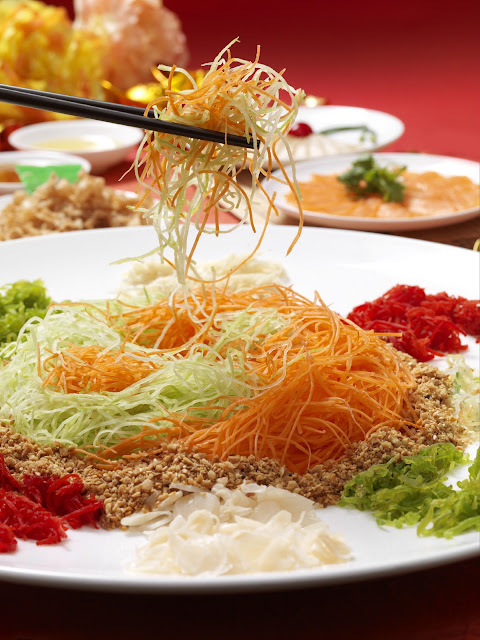 Let's lou hei' or toss in greater prosperity and wealth this lunar new year at Zuan Yuan Restaurant. Available for dine-in and takeaway. Usher in a prosperous lunar new year with their auspicious 9-course set menus signifying all things good, wealth, prosperity and happiness. Priced at RM988++, RM1188++ and RM1388++ per table of 10 persons, the set menus are available for lunch and dinner. The set menu priced at RM1388++ per table of 10 companies dishes such as Yee Sang with Sliced Abalone and Snow Pear, Double-Boiled Shark's Fin with Dried Scallop and Vegetable, Roasted Chicken and Duck Platter accompanied with Marinated Jelly Fish, Steamed Coral Fish with pickled Radish and Chili ,Wok-Fried Tiger Prawn Hong Kong style, Braised Sliced Australian Abalone with Dried Oyster and Sea Moss in Golden Bag served in Claypot, Steamed Lotus Leaf Glutinous Rice with Sliced Duck and Chicken Sausages, for desert, there is Double-Boiled Korean Ginseng Root with Hasma, Honey Longan and Snow Lotus Seed as well as Deep-Fried Avocado Custard with 'Ninko'. For a reunion meal with the family or a gastronomic celebration with friends and business associates, make your way to Zuan Yuan Chinese Restaurant. Tuck into a treasure trove of delicate dim sum specially created just for the Lunar New Year. New creations available on the special ala carte menu includes Steamed Seafood Dumpling with Golden Pumpkin Soup and Shark's Fin, Steamed Fish Dumpling with Sea Moss and Green Pea, Deep-Fried Seaweed Roll with Prawn Paste, Steamed Vegetable Roll with Pumpkin, Carrot and Winter Melon, Deep Fried Squid Ball with Sesame and Deep-Fried Prawn Dumpling with Ebiko Salad Sauce. Priced from RM10++ per serving. Available for lunch only. Zuan Yuan remains open on the eve of Lunar New Year and throughout the fifteen days of the Lunar New Year. For reservations at Zuan Yuan, please call (603) 7681 1159.